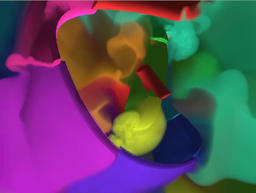 Requires Kineme3D, v002 Optical Flow 2.0, v002 Blurs 2.0 and Ribbon2.fbx 3D object file. Ribbon2.fbx must be kept in the same folder as RibbonDance2a.qtz. This study, a variation on Abeilles Azurées, incorporates Vade's v002 Optical Flow 2.0 plugin, recently updated for Quartz Composer 4 and OS X 10.6. The ReadMe contains several usage examples. The composition will function properly as an image filter effect in CamTwist. It's also functional in VDMX, but hasn't been extensively vetted in that application. Input splitters have been included on all the published ports at root. If you use it in VDMX, let me know how it goes for you. RibbonDance2a.zip contains RibbonDance2a.qtz, Ribbon2.fbx and a ReadMe. Probably worth mentioning that the ribbon object can be easily tucked away under the blur and optical flow effects. No need to have it be visually persistent up front if it gets old. Just jiggle a few sliders until it dissolves. Works beautifully on both 10.6.2 and 10.5.x. It is quite incredible just how flexible QC is in regards of giving so many different ways of treating graphical input. Lovely to see the v002 patches / plugins working in 10.6.x . Not to sound trite, but I like how you use the K3D ripple effect on this. It's really cool on the objects. I've been realizing lately how great the ripple effect is. Great color and look. Tasty! Thanks so much for the 10.5.x vetting, cybero. Glad to hear it's functional there. Agreed, QC's flexibility is tremendously appealing. And Vade is truly generous to the community with his v002 contributions. I'm sincerely grateful. Good eye. You caught that! It wasn't until just yesterday that I realized the benefit of publishing an input splitter to root from that X Strength port on the ripple patch. Could have done it ages ago but I missed it. Turns out that it is indeed worth having it published because the Strength parameters on the K3D ripple patch have the advantage of being amongst those ports that don't create jerky imagery when manipulated via a slider. Your work enriches us all. nice lee, glad to see the ribbon thread resurrected. Thanks, dust! I was going to re-upload a new archive and include an app version of the composition along with a new ReadMe, but that particular zipped package ended up weighing in at a hefty 10MB as opposed the the current archive size of about 1/2MB, so I put it on hold for now. VjNokami was kind enough to give RibbonDance2 a trial in VDMX at the SHAREMTL visualists gathering in Montréal Quebec on Sunday evening, November 15, 2009. We learned that the video input patch which I had included for convenience (unattached to anything), had to be removed before VDMX would accept the composition. That done, the composition then appeared to work fine in that particular application. I've now uploaded a revised edition, entitled RibbonDance2a, here to Kineme as well. Included in the upload is a revised ReadMe which includes the composition settings examples previously posted in this thread. "Artist Credit: Lee Grosbauer. Image Name: Ribbon Dance 2. Software Used: GroBoto™. More about Software Used: Mac OSX 10.6, GroBoto 2.3.3, Quartz Composer 4.0, Kineme3D 1.2 plugin, v002 Optical Flow 2.0 plugin. Figures/Content: Movie. Quartz Composition excerpt. The ribbon object was created in GroBoto, exported in OBJ formatting and then converted to FBX formatting with the Autodesk FbxConverter for use in Quartz Composer via the Kineme3D plugin. The video excerpt was recorded with Kineme QuartzCrystal. The Quartz Composition itself is publicly available at kineme.net in the Composition Repository. The composition is dependant on the plugins listed above. This video excerpt is also currently published at Vimeo.com. Category: Film & Animation. Tags: groboto, 3d, smithmicro, animation, video"
That's interesting about that video input, and the fact that it wasn't even attached. I've always thought that app was quirky, but cool for sure. Yeah, it's worth knowing not to include (or to remove) those default QC video input patches in compositions destined for VDMX. No big deal I suspect, however. VDMX has its own tools for bringing video into the application. My thanks to you for the lead on GroBoto for object creation and for the tips on finessing the exported object for Kineme3D, George. Your growing.qtz was the model. Much appreciated. I always get these emails about "such and such doesn't work in VDMX, do you know how to get it going please...". I've become familiar with the app pretty much solely from people writing me questions about how to make it work! (This begs the question of why people don't just write VDMX's makers...or maybe they aren't getting answers, I don't know).